Notice the nose, lipless mouth and hair. 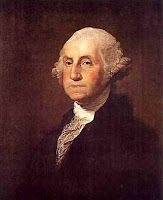 Could accused master mind of the mother of all ponzi schemes Burney Madoff be George Washington? He stole so much money he looks like a dollar bill.